1903 The original American League team in Baltimore, which was purchased by Frank Farrell and Bill Devery after the club ceased operations in the Charm City, receives approval from 15 of 16 the major league owners to move the team to New York to play as the Highlanders. Giants owner John T. Brush cast the dissenting vote, believing the new club, who will become known as the Yankees in 1913, will compete for fans in the Big Apple. 1971 The Cubs' catcher Randy Hundley suffers a badly sprained knee and will play only nine games this season. In 1968, the venerable backstop caught 160 games for Chicago, starting 156 of those contests, and played every inning in 146. 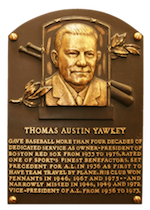 1980 National League outfielder Chuck Klein, who compiled a .320 batting average during his 17-year career, and former Red Sox owner Tom Yawkey are both elected to the Hall of Fame. 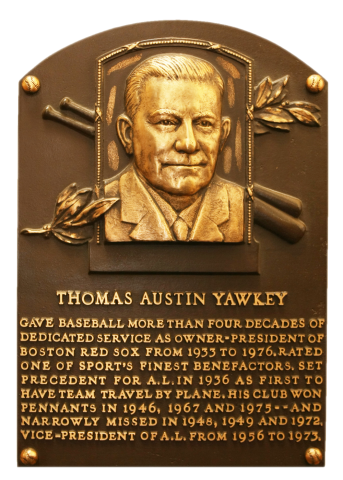 Yawkey is the first person to be selected who was not first a player, manager or general manager. 1982 Ballantine Books publishes the first of seven annual Bill James Abstracts, bringing the author into the national spotlight for his statistical insight into the game. The sabermetrician's original self-published efforts, written while working the night shift as a security guard at the Stokely-Van Camp's pork and beans cannery, introduces baseball fans to new ways of measuring a player's ability, using stats such as such Runs Created. 1991 Jim Palmer's attempted comeback at the age of 45 comes to an end when the newly elected Hall of Famer tears his hamstring warming up before an exhibition appearance against Boston. The Orioles right-hander, who hadn't thrown a major league pitch in seven seasons, keeps his 268-152 and 2.86 ERA intact which he accomplished during a 19-year career on the mound. 2001 Richard Hidalgo signs the third-richest contract in Astro history with a four-year $32 million deal with the club. The outfielder's pact is less than teammate's Jeff Bagwell's $85 million (5 years) and Craig Biggio's $33 million (4 years). 2003 The second exhibition season bench-clearing brawl this week occurs when a raging Mike Piazza charges the mound after being hit by a pitch thrown by Guillermo Mota, who makes it to the dugout without being caught. The incident may be a follow-up to a similar event last spring when a shoving match between the two players resulted when the Mets' All-Star catcher waited for Mota and grabbed the Dodger reliever by the jersey as he was coming off the field in the eighth inning of the game. 2006 Over 15,000 Twins fans attend a memorial service at the Metrodome to pay their final respects to Kirby Puckett, who died unexpectedly, at the age of 45, after suffering a stroke last week. During the emotional ceremony, former teammates and fellow Hall of Famer Cal Ripken lighten the mood by sharing humorous anecdotes about the beloved Minnesota outfielder with the crowd. 2008 The benches clear in a rare spring training brawl when Shelley Duncan slides into second base, with his spikes aimed at Rays infielder Akinori Iwamura after being thrown out by a wide margin. The incident was precipitated by Tampa Bay's aggressive play four days ago which resulted in a home-plate collision which injured Yankee catcher Francisco Cervelli. 2010 In the opener of a scheduled three-game exhibition series in Taiwan, the Dodgers are defeated by an All-Star squad from the Chinese Professional League (CPBL) at Taipei's Tienmu Baseball Stadium, 5-3. The road trip is the team's second journey to the Chinese island, having finished with one win and two losses during a trio of spring training games in 1993. 2015 Will Ferrell, hoping to raise awareness of organizations trying to cure cancer, plays nine different positions while appearing for ten teams in five Cactus League exhibition games in Arizona. The comedian's effort, detailed in an upcoming HBO documentary, is severely criticized by former NFL coach and broadcasting legend John Madden, who calls the stunt disrespectful and insulting to the game of baseball.